Bitcoin may have emerged from a shadowy corner of the internet, but soon, it'll have its own government affairs office in Washington. According to the crypto-currency's biggest advocates, who assembled at the second North American Bitcoin Conference this weekend in Chicago, Bitcoin is all grown up. In reality, it's entering adolescence—which is way more interesting. 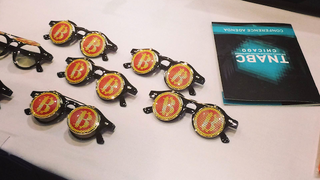 If Bitcoin had a tumultuous year—from the collapse of its foremost exchange to New York state's opening salvo of regulation attempts last week—you wouldn't know from walking into the cavernous convention center next to Lake Michigan, where hundreds of people gathered for the two-day conference. Instead, I found a scene familiar to anyone's who's ever attended a trade show, right down to the free coffee, awkward introductions, and junk swag, including lovely(?) bitcoin-emblazoned sunglasses. Like any good conference hanger-on, I was drawn to the swag first. Most of it was being handed out by the conference's hardware hockers, ready to sell me on the best mining machines in the game. These are the specialized, super-powered machines dedicated to solving complex cryptographic problems in order to create more bitcoin. In the early days, you might have been able to solve these problems using your home computer or laptop. But bitcoin is a "self-regulating" currency, which means the equations become harder in order to keep the creation rate steady. By now, mining so much as a single coin requires massive amounts of computing power, and so a cottage industry of suppliers has sprung up to supply the hardware needed by these burgeoning businesses. A board from one of many machines on display at the conference. First up was Minersource, a Denver-areas startup whose co-founder, Dan Murtha, took a semester off of engineering school when his side business—selling mining hardware—became a full time job. One semester became two, and then a hiatus. Today, Murtha and his partner run a six-person company that sources hardware from overseas and sell it to American miners. It's a more complicated business than it sounds. Because mining machines are advancing at such a speed and because they're novel pieces of hardware, it's common for a customer to order a machine only to discover that by the time it arrives, it's already useless. I asked a rep from another mining outfit to give me advice on how to buy hardware and not get screwed. His answer: "Don't pre-order." Only buy hardware that's in-stock when you order it. Murtha and his team are experimenting with another service, colocation; they'll order, set up, and maintain your mining operation in their own space. To give you an idea of just how much firepower miners are throwing at mining, the price of electricity was a major topic amongst the day's panels. According to several speakers, the price of power in the US means that most of the innovation is being done outside of the country. "America is still quite a complex place to do bitcoin business," one speaker added mournfully during the Venture Capital panel later in the day. But the day's first and most newsworthy event was a press conference. "Good morning," started a woman standing on the dias in front of hundreds of attendees sitting at long banquet tables. "If it was Sunday, I'd call this bitcoin church." This was Perianne Boring, a D.C. journalist and analyst who came before us to announce the creation of bitcoin's "first government affairs office." Boring wants to advocate for bitcoin amongst lawmakers, and her "Chamber of Digital Commerce" is aiming to become the main liaison between policy makers and the bitcoin community. Why does bitcoin—a cryptocurrency that heralds decentralization—need a presence in Washington? Because both state and Federal governments are beginning to move to regulate it. Last week, New York became the first state to propose rules regulating bitcoin trading businesses. Depending on who you ask, it's either wonderful or terrible for bitcoin. But one thing is almost certain: It's inevitable. What I heard over and over as I moved between sessions is that bitcoin has flown the coop. It's quickly establishing itself in the conventional world of finance, and with that comes regulation. A few key words came up over and over again in Boring's (interesting!) speech. Legitimacy. Authenticity. Security. "We are not a libertarian paradise," she added. Rather, bitcoin has the power to "increase the standard of living for all." She was regularly interrupted by applause. Boring's optimism wasn't unique. In every session, bitcoin was talked about as a mechanism that will save the world. "Building bitcoin software will be the most important thing I can do in my life," said Peter Smith, the COO of Blockchain. Being paid in bitcoin, according to a company called BitPay that was announcing a partnership with HR company Zuman, is an "employee benefit." And again and again, speakers referred to bitcoin as a solution for the developing world. It's "a way for everyone to have a bank in their pocket without having a bank," said one venture capitalist at the day's VC panel. Outside in the hall, a rep from a nonprofit called BitGive explained how donations from the bitcoin community are being used to fund public health initiatives around the world. I'm not sure what I, a bitcoin novice, expected. It wasn't a pro forma trade show. Still, the more I thought about it, the more it made sense. These entrepreneurs, investors, developers, and full-fledged businesses that deal with bitcoin all want to secure its place in the global economy at any cost, making it more like a professional industry and less like an internet subculture fraught with risk from heists. The mainstreaming of bitcoin is a little bit like your favorite hyper-local band signing with Interscope: Older fans are alienated and either move on or begrudgingly subsist, while a flood of newbies rush onto the scene. The disparity amongst attendees wasn't night and day, but it existed. At one point, I sat between a 60-year-old man in an impeccable suit, jotting notes on a legal pad, and a trio of 20-somethings with creative facial hair, vaping wildly. The diversity of attendees reflects a growing debate within the bitcoin community that pits purists who argue that bitcoin can only flourish if it's left in peace against those who want to legitimize it with state and federal regulation. Business Insider described the schism as Bitcoin's Civil War, which highlights the immensity of the changes confronting the crypto-currency. As bitcoin's value rises and its legitimacy increases, so will its ties to the conventional finance world. And, of course, the governments and agencies attempting to impose existing standards onto it. Even bitcoin advocates who are for regulation argue that those standards need to be rewritten to fit this entirely nascent system that's so unlike any other economic framework on earth. Though the conference I attended was as reserved and professional as could be, that was exactly what made it compelling. Many attendees and presenters weren't as interested in bitcoin's cultural genesis—like its early relationship to the online drug market Silk Road—as its power as an economic model. These were young entrepreneurs, economic students, and venture capitalists who are drawn to bitcoin because the conceptual framework of decentralization and automated self-regulation stands in such attractive contrast to the current system that, in the eyes of many, is currently failing. One of the best-attended presentations of the day was a talk given by Charlie Lee, founder the popular alternative crypto-currency LiteCoin. Lee wasn't debating regulation or mining—he was talking about branding. Specifically, how he designed, branded, and launched his own alternative digital currency. His talk amounted to a how-to for anyone who wants to launch their own coin. Based on the packed house he was addressing, hundreds of people are. Lee's talk wasn't the most hotly debated or extreme, but in a way it was the most compelling. Here was a group of hundreds of people learning about how to launch their own alternative currency systems on the internet. Just a decade ago, it was hard to imagine a scenario in which such a diverse chunk of the public would be interested in attending a convention about an economic system—much less be interested in creating their own. Whether bitcoin's future is as a federally-regulated system or an entirely unregulated alternative network, it's altering the course of the economic vehicle our world is built on. The only question that remains is in what direction it'll move in next—and by whose lead.